It appears 2K Games let the Bioshock: The Collection assets out one day early. We’re not sure why they didn’t just announce it at that point if the officially planned reveal was mere hours away, but….it’s here now. 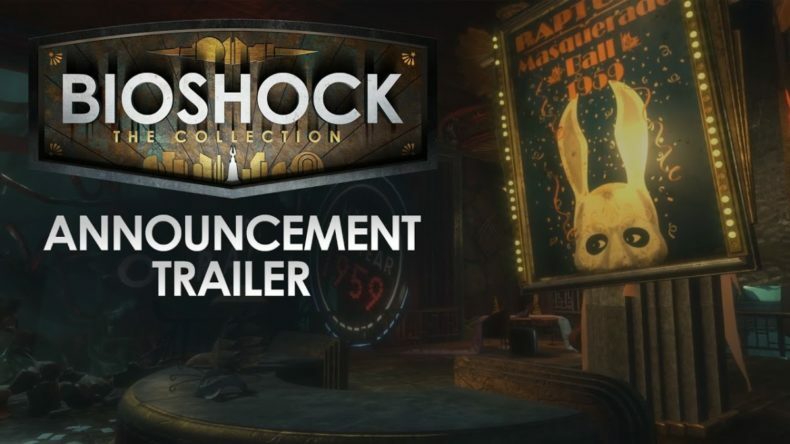 Bioshock: The Collection will be out September 13 and contain remastered versions of the three Bioshock games that exist, plus all the DLC for each and some new bonuses too. Since we’ve already shared our own words about this collection, we’ll turn the microphone over to 2K Games and their press release. Countless fans have asked for this since the PlayStation 4 and Xbox One arrived – and we listened! Working with Blind Squirrel Games, we’ve remastered BioShock, BioShock 2, and BioShock Infinite for PlayStation 4, Xbox One, and PC making them look better than ever*. BioShock: The Collection brings the three titles together for the first time, complete with all single-player DLC** and a never-before-seen video series, “Director’s Commentary: Imagining BioShock,” which includes insights from Ken Levine. o The video series, “Director’s Commentary: Imagining BioShock,” featuring Ken Levine, creative director on BioShock and BioShock Infinite and Shawn Robertson, animation lead on BioShock and animation director on BioShock Infinite. o Challenge Rooms: Outside the story of BioShock, tackle puzzles, splicers and Big Daddies. And achievements, of course. o Burial at Sea – Episode 1 & 2 Add-On Packs: This major two-part DLC pack completes the BioShock trilogy by taking the series back to where it all began. Return to Rapture just before the events of the original BioShock! o Columbia’s Finest Pack: Combines the contents of the Industrial Revolution Pack and the Upgrade Pack and includes 500 Silver Eagles, five Lock Picks, six unique Gear items, and two weapon upgrades: Comstock’s China Broom Shotgun and Comstock’s Eagle Eye Sniper Rifle. Remember: A man chooses. A slave obeys. So, would you kindly follow the new @BioShock handle on Twitter, visit us on Facebook or go to 2k.com/bioshock and prepare for a remastered BioShock experience? BioShock: The Collection for Xbox One, PlayStation 4, and PC will be available in North America on September 13, Australia on September 15, and internationally on September 16. *BioShock Infinite is not being remastered on PC because it already meets current-gen console standards and runs smoothly on high visual settings. **BioShock: The Collection will not include BioShock 2 multiplayer.